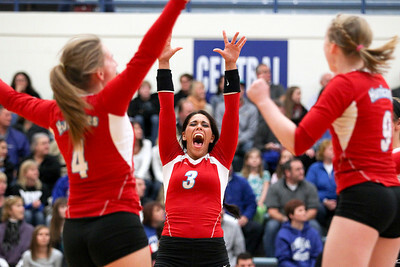 Sarah Nader- snader@shawmedia.com Marian Central's Frankie Taylor (center) celebrates a point during Thursday's Class 3A Burlington Central Sectional semifinal against Burlington Central November 7, 2013. Marian Central defeated Central, 2-1. 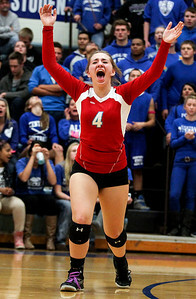 Sarah Nader- snader@shawmedia.com Marian Central's Katherine Adams celebrates a point Thursday's Class 3A Burlington Central Sectional semifinal against Burlington Central November 7, 2013. Marian Central defeated Central, 2-1. Sarah Nader- snader@shawmedia.com Marian Central's Alex Kaufmann dives for the ball during Thursday's Class 3A Burlington Central Sectional semifinal against Burlington Central November 7, 2013. Marian Central defeated Central, 2-1. 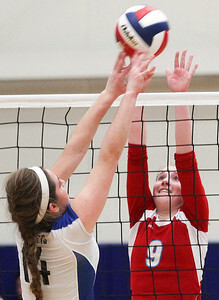 Sarah Nader- snader@shawmedia.com Marian Central's Rachel Giustino jumps to block the ball during Thursday's Class 3A Burlington Central Sectional semifinal against Burlington Central November 7, 2013. 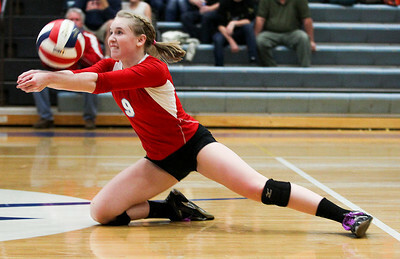 Marian Central defeated Central, 2-1. 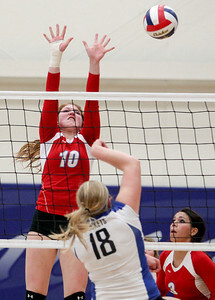 Sarah Nader- snader@shawmedia.com Marian Central's Alex Kaufmann jumps to block the ball during Thursday's Class 3A Burlington Central Sectional semifinal against Burlington Central November 7, 2013. Marian Central defeated Central, 2-1. 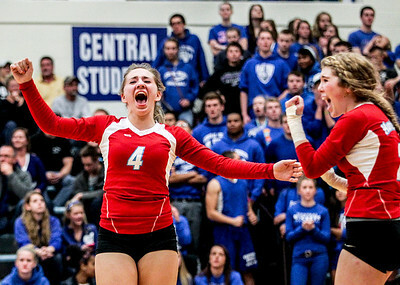 Sarah Nader- snader@shawmedia.com Marian Central's Rachel Giustino celebrates a point during Thursday's Class 3A Burlington Central Sectional semifinal against Burlington Central November 7, 2013. Marian Central defeated Central, 2-1. 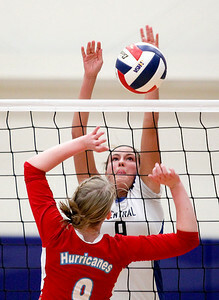 Sarah Nader- snader@shawmedia.com Burlington Central's Jenna Schudel jumps to block a ball during Thursday's Class 3A Burlington Central Sectional semifinal against Marian Central November 7, 2013. Marian Central defeated Central, 2-1. 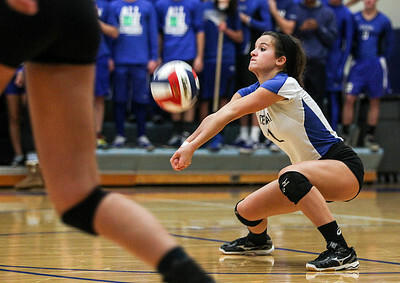 Sarah Nader- snader@shawmedia.com Burlington Central's Brianna Venturini returns the ball during Thursday's Class 3A Burlington Central Sectional semifinal against Marian Central November 7, 2013. Marian Central defeated Central, 2-1. 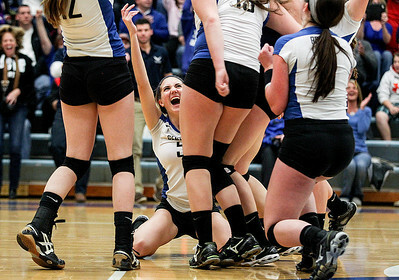 Sarah Nader- snader@shawmedia.com Burlington Central's celebrates a game two win during Thursday's Class 3A Burlington Central Sectional semifinal against Marian Central November 7, 2013. Marian Central defeated Central, 2-1. 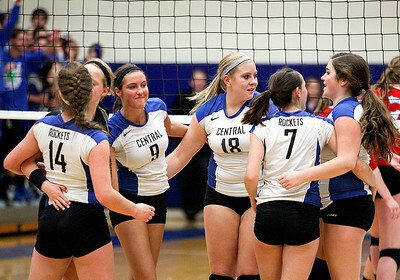 Sarah Nader- snader@shawmedia.com Burlington Central reacts after losing game one of Thursday's Class 3A Burlington Central Sectional semifinal against Marian Central November 7, 2013. Marian Central defeated Central, 2-1. 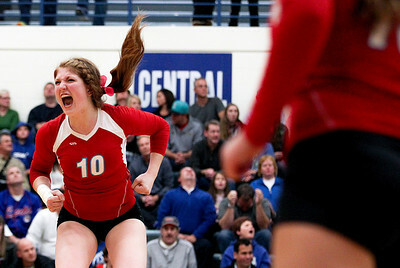 Sarah Nader- snader@shawmedia.com Marian Central's Frankie Taylor reacts after winning Thursday's Class 3A Burlington Central Sectional semifinal against Burlington Central November 7, 2013. Marian Central defeated Central, 2-1. Sarah Nader- snader@shawmedia.com Marian Central fans cheer on the girls volleyball team during Thursday's Class 3A Burlington Central Sectional semifinal against Burlington Central November 7, 2013. Marian Central defeated Central, 2-1. 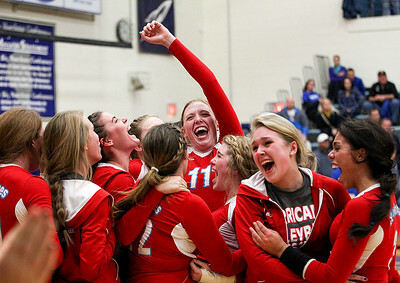 Sarah Nader- snader@shawmedia.com Marian Central celebrates after winning Thursday's Class 3A Burlington Central Sectional semifinal against Burlington Central November 7, 2013. Marian Central defeated Central, 2-1. 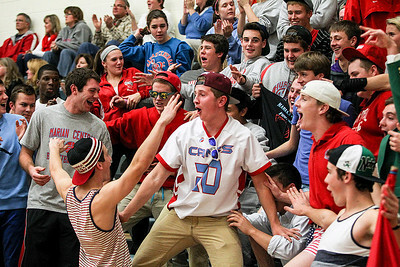 Marian Central fans cheer on the girls volleyball team during Thursday's Class 3A Burlington Central Sectional semifinal against Burlington Central November 7, 2013. Marian Central defeated Central, 2-1.